Chuy and I are both on a quest to a new healthy lifestyle in 2014. We are working on losing weight, eating right, and getting in more exercise. Something that I started doing last year was incorporating a healthy green smoothie into my daily diet. This is a great way to stay full, get all of your nutrients, and the taste is pretty irresistible! The best part is you can share part of your healthy green smoothie with your dog as it has added health benefits for them too! 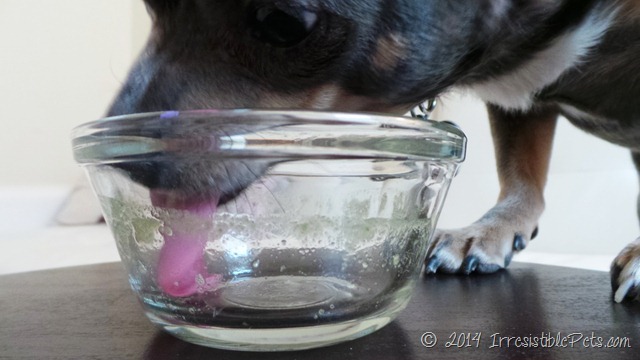 You can also use this same recipe to make frozen dog treats! Spinach contains flavonoids and carotenoids that have anti-inflammatory and anti-cancer properties to benefit your dog’s health. 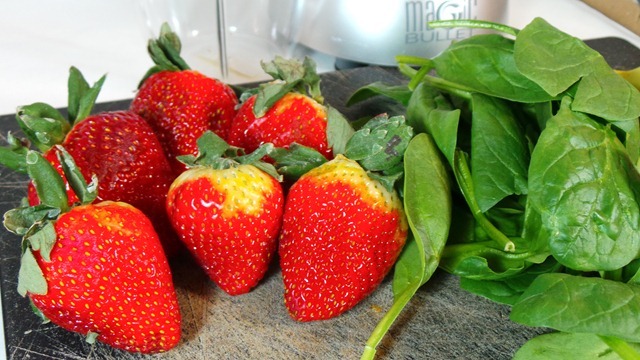 Strawberries & Blueberries are a nutritional powerhouse for both you and your dog. Keep a bag of frozen strawberries in your freezer to make smoothies for yourself, and you’ll also have a crunchy snack on hand for man’s best friend. Just don’t feed unlimited amounts, because even though the sugar in strawberries is natural sugar, too much can be bad news. Bananas have loads of amino acids, electrolytes, minerals, vitamins B6 and C, potassium, fiber and manganese. 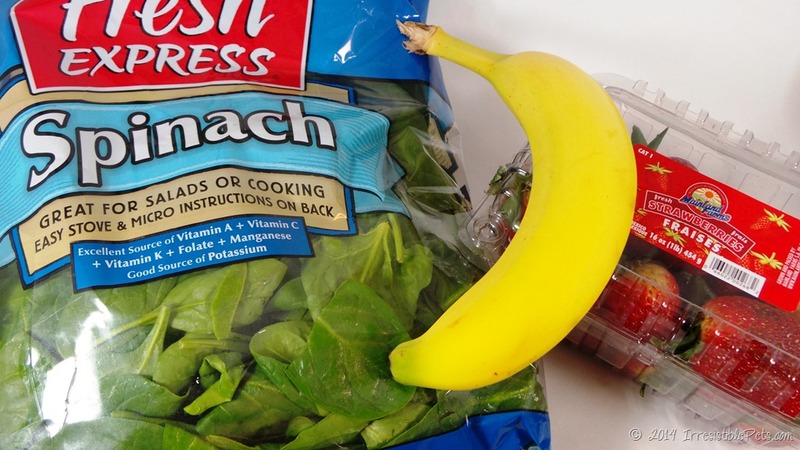 Bananas, just like berries, have sugar, so be sure to balance it out with exercise and don’t overfeed! 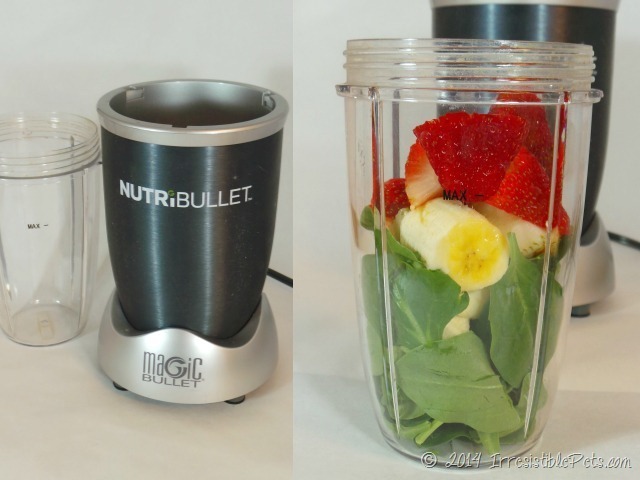 I highly recommend investing in a Nutri Bullet if you plan on making a lot of green smoothies. It’s so simple to use and can also be used to create soups and sauces. Plus, if you are on the go, you can snap on a lid and take the shaker with you! This recipe makes enough for one tall glass for you and one small bowl for your pup! 1. 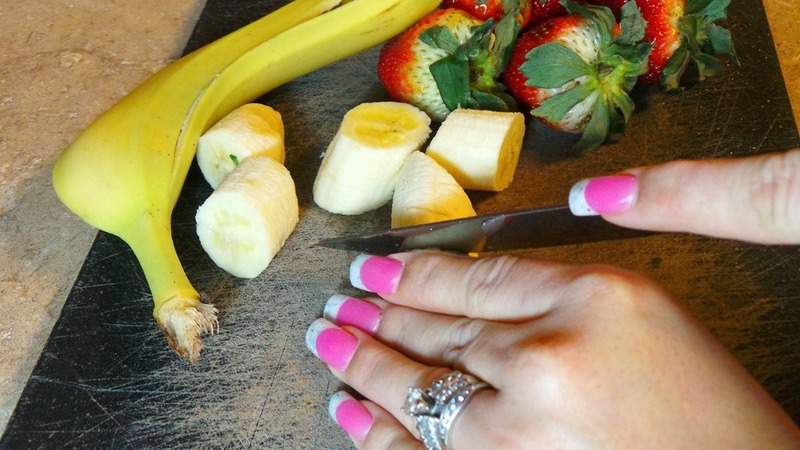 Take a knife and cut the banana and strawberries into smaller pieces. 2. 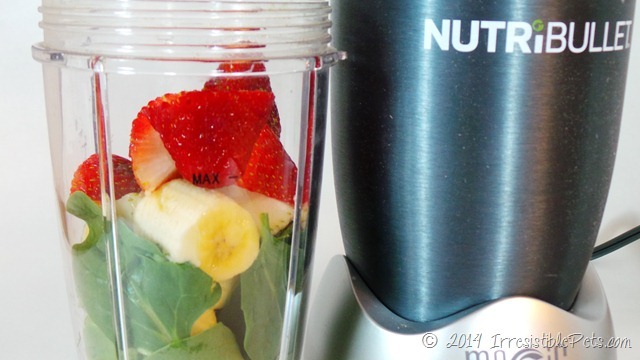 Combine all of the ingredients (including water) in your Nutri Bullet or blender. 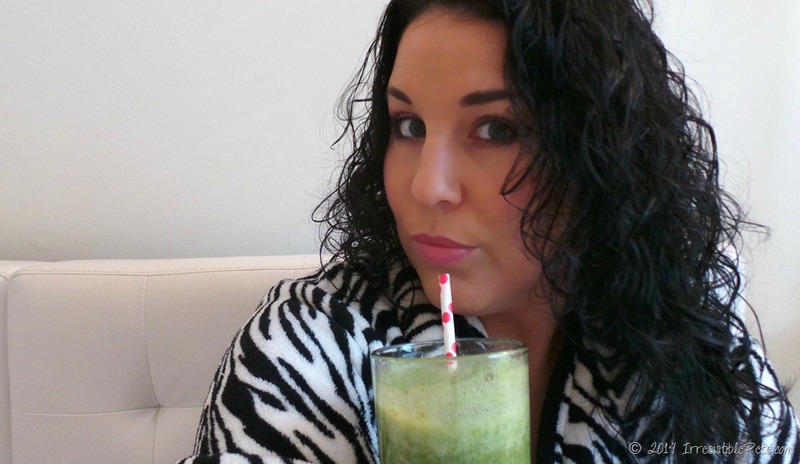 I typically drink my green smoothie early in the morning while I’m getting ready for work . . . hence the wet hair and zebra robe! If I don’t drink one in the morning, I usually have it before or after a workout. 4. Pour the remaining mixture into a small bowl for your Irresistible Pet! 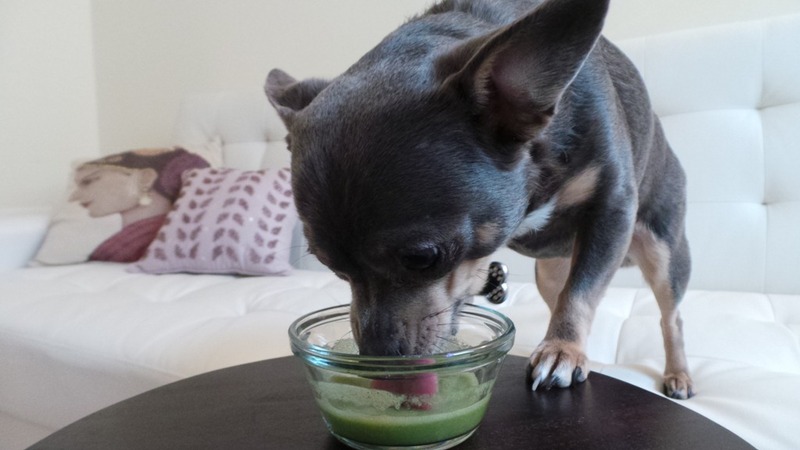 Chuy Chihuahua Thinks Green Smoothies are Irresistible! I love that I can make this as a treat for Chuy and there’s no additives, preservatives, or anything processed about it! I can trust that he is getting something pure and healthy to help with his weight loss plan. 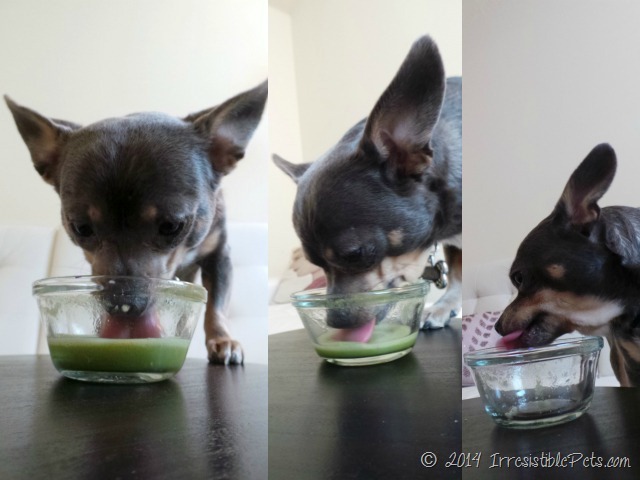 Oh and Chuy absolutely finds these green smoothie treats irresistible! 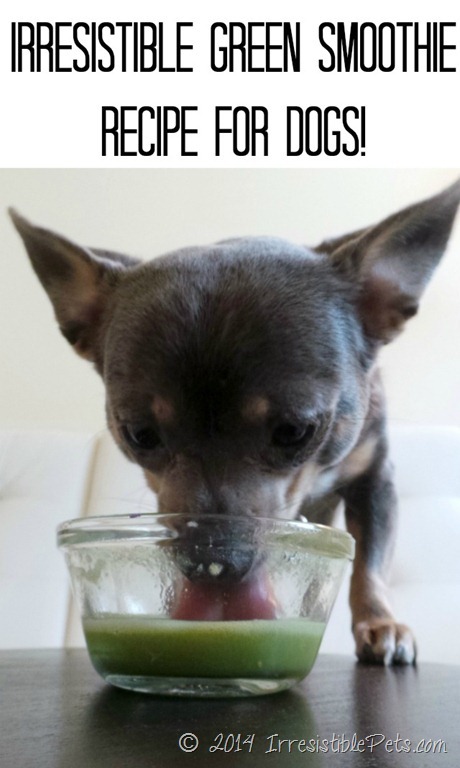 All treats and recipes featured on Irresistible pets have been created by myself and tested only on my dog, Chuy which means they may or may not work the same for your pet. Treats should not replace your dog’s regular diet. Always check with your vet when adding anything new to their diet. 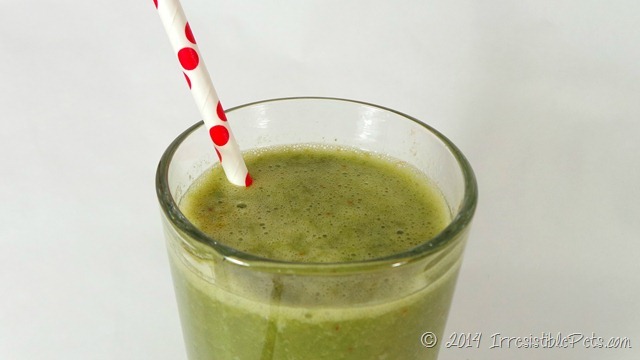 Have you ever tried a Healthy Green Smoothie? If so, please leave a comment below or leave any questions you might have. 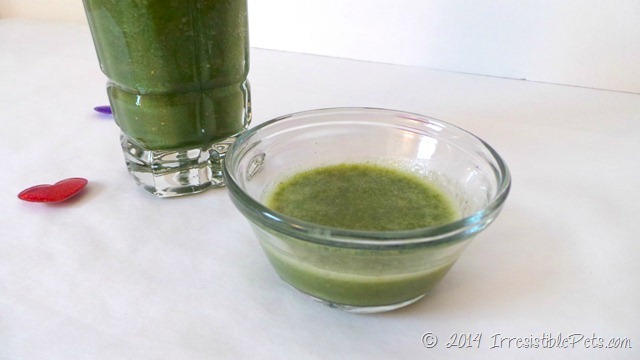 I got a Ninja Blender for Christmas and I’ve been on a green smoothie kick too! I never thought of giving some to Pug. He loves fruits and veggies, I bet he would think he was getting an awesome treat if I shared. I will have to keep this in mind, especially since I tend to make just a little too much when I use the large pitcher instead of the individual to-go cup! I hear wonderful things about the Ninja! Yes, Pug would love it! I wonder if these would be good as a frozen treat in the summer for the pups?! 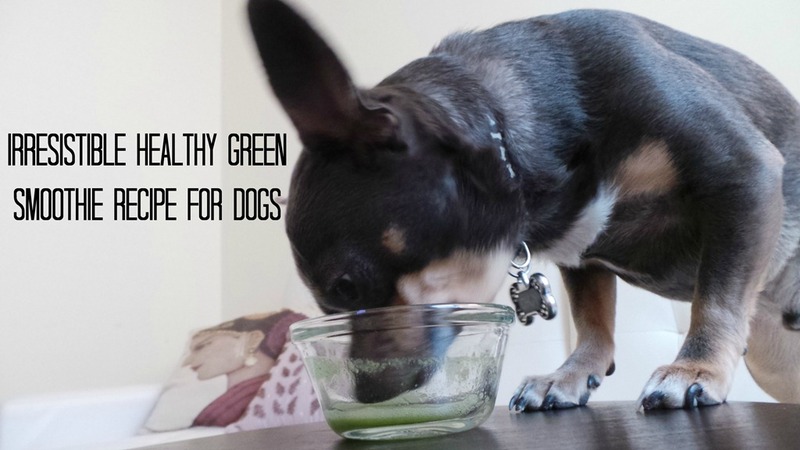 I had never even thought about giving dogs a green smoothy, what a great idea! I’ve been wanting to try almond milk for awhile now. Good luck on your healthy journey! Chuy and I will be cheering you on! (Trixie Mae) but i really need to watch her sugar in tack. are there fruits that are safe for dogs and what are the ones with the least sugar. content. Hey, dogs like yoghurt and cottage cheese (low fat) too! 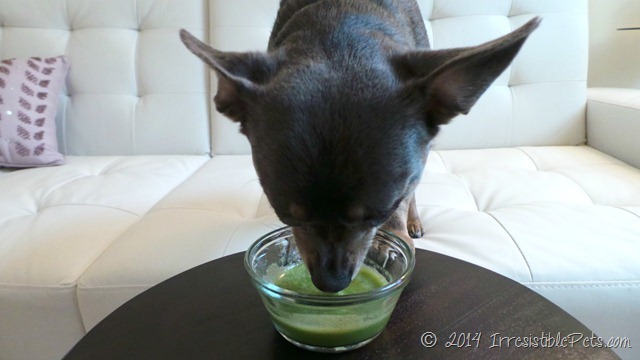 I often make a ginger/apple/turmeric/bee pollen/carrot smoothie for me and my dogs! They love it! I am obsessed with keeping them healthy. There is so much we can do for our furbabies!